(11) Slawomirski L. Use of PROM in OECD member states. 17-2-2017.
should provide support for the self-assessments? Eval Program Plann 2015 Jun;50:43-6. 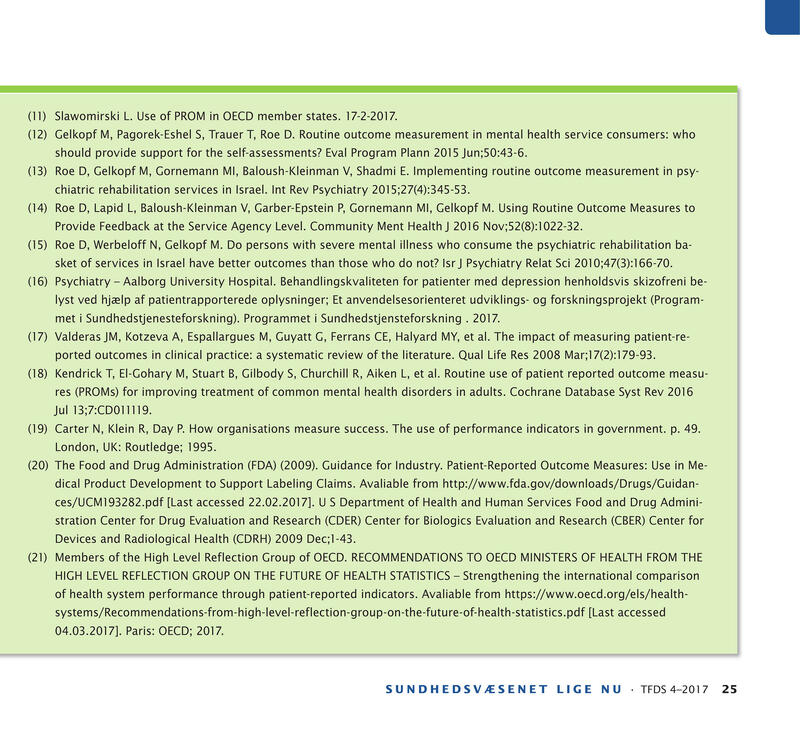 (13) Roe D, Gelkopf M, Gornemann MI, Baloush-Kleinman V, Shadmi E. Implementing routine outcome measurement in psychiatric rehabilitation services in Israel. Int Rev Psychiatry 2015;27(4):345-53. Provide Feedback at the Service Agency Level. Community Ment Health J 2016 Nov;52(8):1022-32. (15) Roe D, Werbeloff N, Gelkopf M. Do persons with severe mental illness who consume the psychiatric rehabilitation basket of services in Israel have better outcomes than those who do not? Isr J Psychiatry Relat Sci 2010;47(3):166-70. (16) Psychiatry – Aalborg University Hospital. Behandlingskvaliteten for patienter med depression henholdsvis skizofreni belyst ved hjælp af patientrapporterede oplysninger; Et anvendelsesorienteret udviklings- og forskningsprojekt (Programmet i Sundhedstjenesteforskning). Programmet i Sundhedstjensteforskning . 2017. (17) Valderas JM, Kotzeva A, Espallargues M, Guyatt G, Ferrans CE, Halyard MY, et al. The impact of measuring patient-reported outcomes in clinical practice: a systematic review of the literature. Qual Life Res 2008 Mar;17(2):179-93. (19) Carter N, Klein R, Day P. How organisations measure success. The use of performance indicators in government. p. 49. Devices and Radiological Health (CDRH) 2009 Dec;1-43.